On June 22, 1988, St. Columbanus celebrated a very special occasion. For the first time in its history a member of the parish was ordained to the priesthood. Rev. 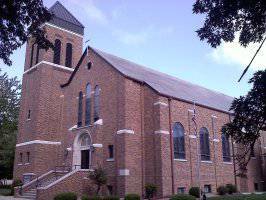 William M. Becker was ordained in the Cathedral of the Sacred Heart in Winona by the most Rev. John G. Vlazny, Bishop of the Winona Diocese. On June 26, 1988, Rev. Becker celebrated his first parish Mass in St. Columbanus Church, Blooming Prairie, MN.